There are no images available or any answers to questions this week as the Matchbox team prepare for the Gathering in just over a week’s time coupled with the public holiday on 4th July restricting the time available. I hope to issue a penultimate report for the coming weekend and my final one during the Gathering. There will not be 52 reports in total as there was a gap after the Gathering last year as so many models were shown in Albuquerque. The display above reveals the range at the end of 1976. 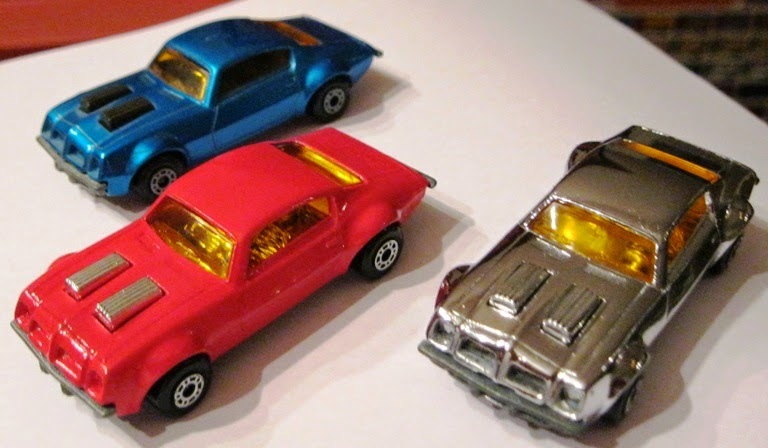 There were many new releases greeting collectors of the Superfast miniatures range in the 1976 catalogue that did not go down at all well amongst many, as they featured futuristic styling. However for the connoisseur of the authentic there were three passenger cars released that did meet with widespread approval. The weirdly styled Mod Rod had held the No.1 spot for little more than four years when it was replaced by a true classic “muscle car”, the American Dodge Challenger. This model was beautifully crafted in bright red, with an unpainted metal base, 5 arch wheels and a chrome interior, which also formed two engine air ducts protruding slightly through the bonnet. The roof was moulded in white plastic, with a clear glass windscreen and small rear window. 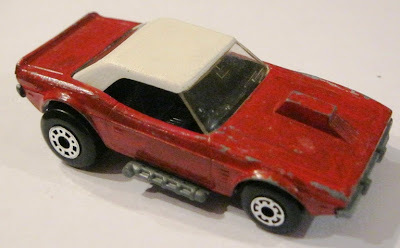 This model was also produced with dot dash wheels in relatively small numbers. However, whilst this was once considered quite rare and desirable, it now attracts only mild interest. This was one of many models Lesney seemed content to do little with in terms of colour change, as even by 1980 it was still exactly the same! Nevertheless, although never shown in any catalogue, the interior was changed to white during 1980 to match the roof. This was a good look and attracts a mild premium. Finally in 1981 the body colour was changed to blue, and at the same time the interior was altered to red. 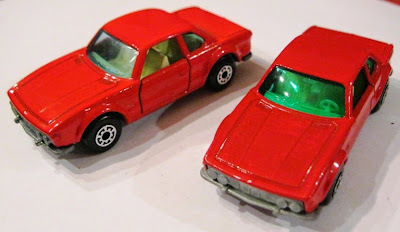 During this transition some red painted bodies were fitted with red interiors, and such red-red models do attract a very strong premium. The roof however remained white on all these variants. As was frequently the case, models re-coloured in 1981 were re-coloured again in 1982, and the Dodge was no exception. The roof was now blue, the interior black, (shown as chrome in the 1982 catalogues which was never the case in reality), and the body was bright orange with white and blue “Revin’ Rebel” tampo print. However, this superb and authentic looking model was also restyled, with the air ducts removed in favour of a small rectangular engine block in the centre of the bonnet, side fitted exhaust pipes which extended from the baseplate and widened rear wheel arches to accommodate large dot dash rear wheels. Pre-production versions had the exhaust pipes formed as part of the interior. A decision was taken at Lesney to split the range into world zones, where some models would appear in different parts of the world with a different number and so the “No.1” designation was removed from the base of the Dodge. This was totally unnecessary as the model remained as No.1 worldwide! 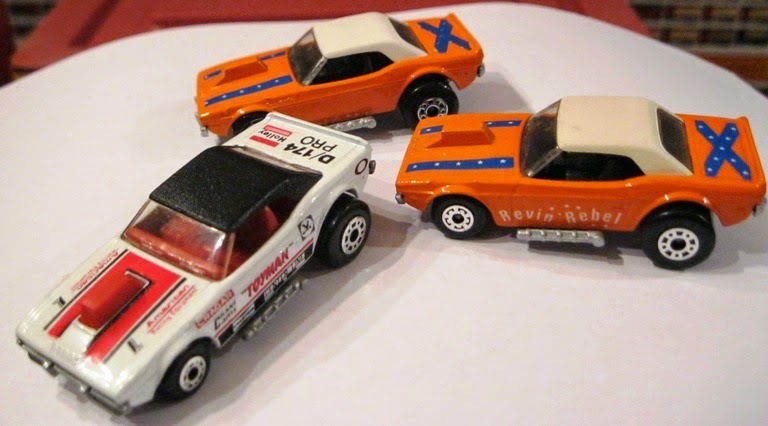 The base name remained unaltered, yet in the USA catalogue for 1982 the model was actually named as “Revin’ Rebel”. This name became commonplace amongst collectors for this styling of the Dodge. What is quite curious is that this styling alteration was considered sufficient enough amongst collectors to designate this Dodge as a different model from the previous incarnation, despite following on directly from it, in the same position and with the same name on the base. 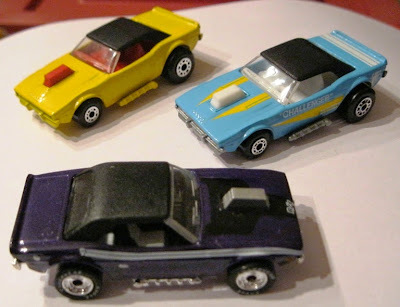 Several other models would, soon after, go through similar body transitions whilst still being considered the same model: examples are the #34 Chevy Pro Stocker, the #52 BMW M1, and the #12 Citroen CX. The orange coloured Dodge could be found fitted with the white roof from the previous model, it could also be found with a plain orange body fitted with either colour roof, or occasionally with plain sides, these are all very collectible, but the Lesney picture box for this model seems to attract even more attention and regularly sells for in excess of £50, as it was only available in Europe, whilst in the USA blister cards were exclusively used. 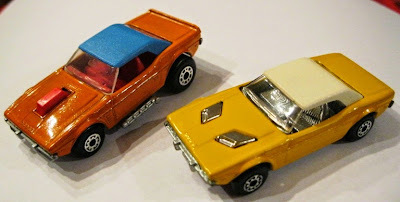 Later examples of the orange Dodge had silver painted bases, which helped improve the appearance of this version as often the unpainted bases on these later Lesney castings were especially dull. The Rebel model was included in the new TP-32 paired with the #61 Wreck Truck in red with “24 Hour” tampo, or the #74 Toe Joe in yellow with “Hitch Hiker” labels. The version in green with these labels as shown in the UK catalogue was an unreleased version. This would prove to be the last Lesney casting of the Dodge, as by the following year the moulds had been sent to Macau, and the body slightly altered further, with the engine block now becoming part of the interior, in red once more, protruding through the bonnet. The base was painted pearly silver, the roof was now black, and the body lemon yellow with a black and red “Toyman” tampo. The wheels remained the same but later the front wheels were changed from 5 arch to small wide dot dash to match the large dot dash rear wheels. In 1987 the Dodge was deleted and a burgundy Jaguar XJ6 took the No.1 position. In fact the Dodge had been given an unplanned two year extension in the range, as the Jaguar had actually been intended for release in 1985 but was held back, probably on the insistence of Jaguar. Indeed the Jaguar XJ6 can be found with two copyright dates on the base, 1984 or 1986! In 1990 the Dodge Challenger, in exactly the same colour and livery as 1987, was re-released as No.34, replacing the Ford RS200, but this may only have been in the USA as the 1992 catalogue shows the Ford still at No.34! The Dodge was also released in a multi pack set in white but otherwise identical to the yellow version in retaining the “Toyman” tampo. It was further released in a very attractive dark blue with black interior, white roof, and white “Hemi” tampo. With Tyco taking over from Universal in late 1992, in 1993 there was no catalogue produced, but in 1994 a small catalogue made for Toys R Us shows the Dodge still in place at No.34, but now re-coloured in garish neon yellow with a black marbled pattern tampo print and a horrific neon pink interior. At the same time the base became grey plastic, and the wheels 6 spoke spiral, making this model a pale shadow of its former self. 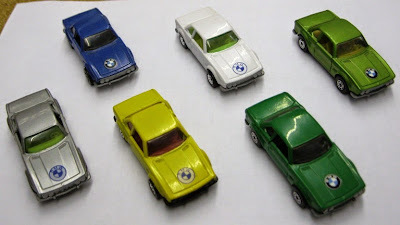 In Germany a set of eight models was released in plain colours, two each in red, green, blue and yellow. The Dodge was one of these eight models, and was released in plain yellow which was quite striking. 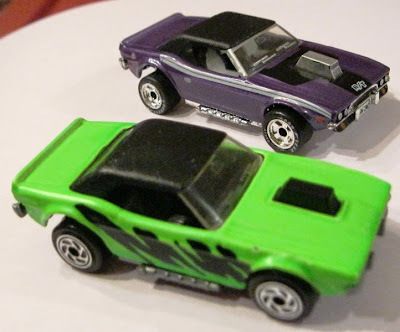 Matchbox introduced 5 packs sets in 1994, and in 1995 they used the Dodge Challenger in one set, now in neon green with black interior and a black stripe tampo to the sides. In 1996 it was utilized once more, now in dark purple with a yellow interior and yellow side stripes, which was somewhat of an improvement. 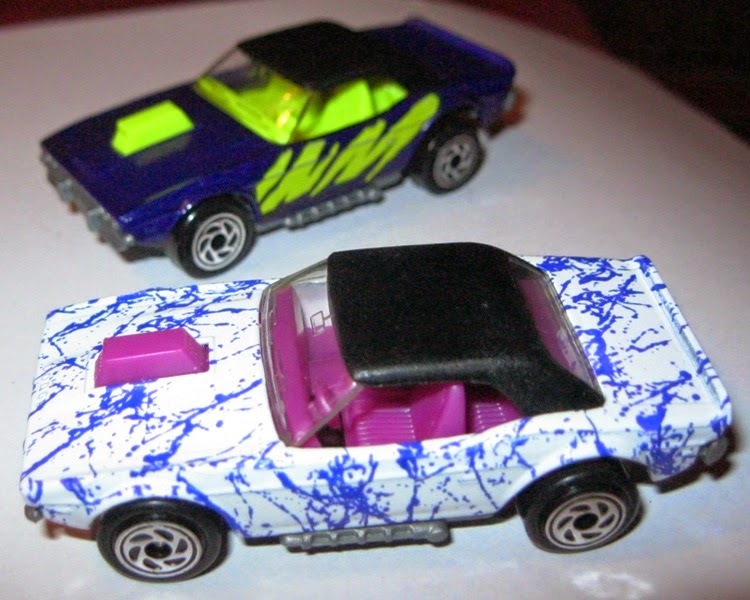 As a single release the body became white with purple marbling and the interior also in purple, and this look was further enhanced later with the addition of 5 spoke concave star wheels in place of the 6 spoke spiral, though such examples are hard to find as they only came on blister packs in conjunction with a Convoy rig as part of the “Highway Cruisers” series. Some of the last releases of this model were in the Premiere range with chrome bases & rubber tyres, and can be found in dark purple, red, and orange. Finally a China made issue with 5 spoke concave star wheels, in red with flames tampo, was released in small numbers and is very hard to locate. Finally to a Dodge Challenger that never was. 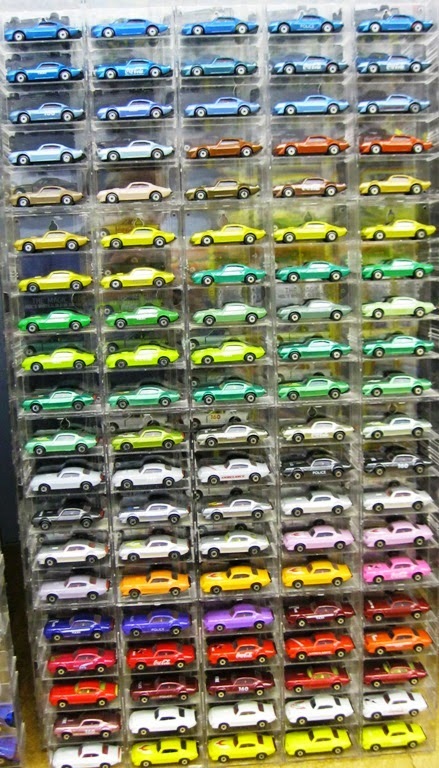 It was decided to expand sales in 1997 by colouring every one of the models in the range gold in addition to the normal models. Some models were very hard to find whilst some were much easier. 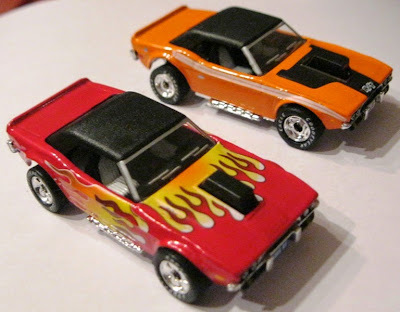 It was originally intended to have the Dodge Challenger at No. 1 but the new Dodge Viper had been produced and at the last minute, the Viper GTS was included. The model shown was one of only a handful produced. 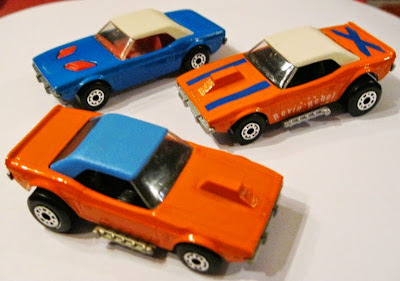 The #4 Pontiac Firebird replaced the Gruesome Twosome, which was another Hot Wheels style model like the Mod Rod and again was first seen in late 1971. The Pontiac in contrast was a faithful recreation of the American classic, with a metallic blue body, chrome interior, amber windows, and an unpainted metal base. It also had two air ducts protruding from the bonnet as an extension of the interior in a very similar fashion to the Dodge, except that they were more pronounced. The wheels were wide dot dash as standard, so that those found with 5 arch are very rare and with maltese cross even rarer and both are recognised and sought after variants. The blue body varies from a quite light, almost non-metallic bright blue, to an intense dark blue which looks especially attractive. This model did not perform as well as the Dodge Challenger, as by late 1980 it had been replaced by the superb ’57 Chevy, so missed out on the 1981 re-colour fervour. This is a pity as pre-production versions indicate what could have been, with superb examples found in green, bright scarlet, and both chrome and gold plate. These last two colours were produced at the same time as the well known #20 Police Patrol in chrome and gold, but in far smaller numbers and thus very few exist. 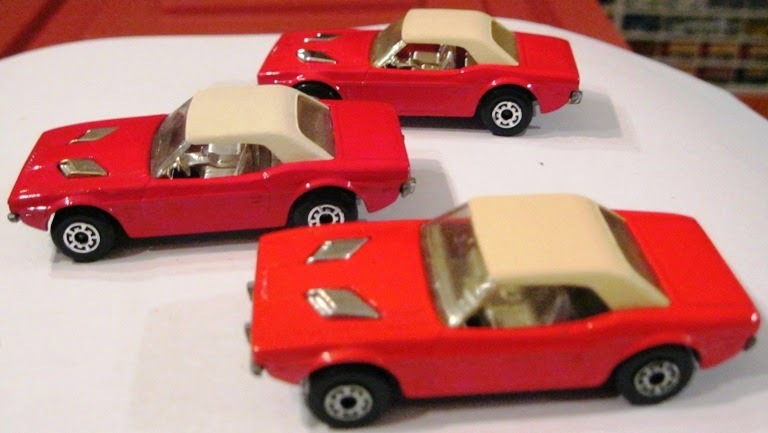 These were all part of a test Lesney made as to the practicality of plating models for general release: they also attempted a chrome #27 Lamborghini Countach in Streaker guise. 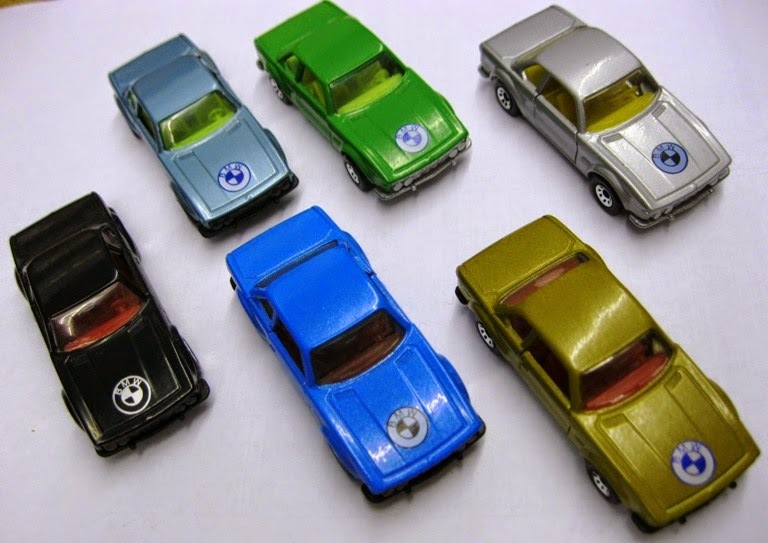 In the end the Roman Numeral #I Silver Streak (#1 Mod Rod) was plated chrome, and the #X “Golden X” (#33 Datsun 126X) was chosen to be plated gold as the first and last of the 1978 range of ten re-released models in different colours. 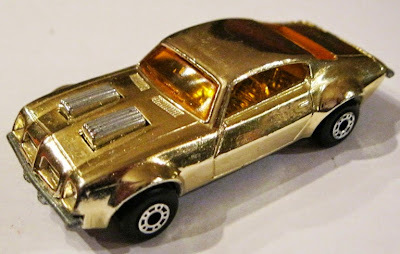 The plating process was good but rarely perfect on these models, especially with the gold model, and so was not taken any further. 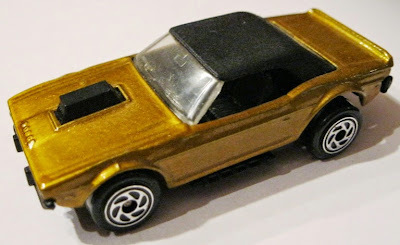 The Pontiac did appear to re-materialise in 1981 as #16 in metallic light gold, but slightly reconfigured and as such this is considered a different model rather than a re-release. I have included some of the Bulgarian Pontiacs below as I forgot to include them last week. The #45 BMW 3.0 CSL was a good example of this German marquee and was unusual in being one of only two models shown for the first time in the 1976 catalogue with a 1976 copyright base plate; the other was the #64 Fire Chief. Two colour trial models are shown below. Released in orange, the BMW had green glass, a light yellow interior, opening doors, and an unpainted metal base plate with 5 arch wheels. A “BMW” logo with stripes label was affixed to the bonnet on most examples, though very occasionally it was left off. The green glass shade can vary considerably, from bright light green, to a somewhat murky green, and a fairly rare almost opaque dark green shade. If you look very closely at the colour trial yellow model above, you will notice that there is no passenger door. Safety standards for toys had been toughened and opening doors now had to pass a series of stringent tests. The doors were twisted and pulled by machine to ensure a child could not remove them. Thus, the door hinges for the BMW were redesigned to meet the new regulations. The design was used by Matchbox for many years afterwards and by other companies who make models with opening doors today. 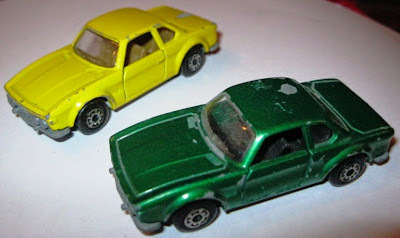 A glance at later BMW Matchbox models will show the two reinforced ribs on the doors which provide strength and a slot for the door spring. The yellow model failed the test!! 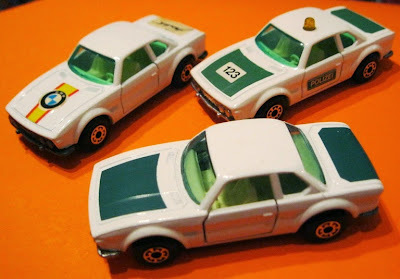 In 1977 this model was used as a German exclusive in the form of a Police Car, with the body now sprayed white and with green tampo print panels to the bonnet and boot, “Polizei” labels to the doors and a “123” label to the bonnet. There are two versions of this model, one with a single amber dome on the roof, the other with a blue dome. In order to fix the dome to the roof, it was fitted through a hole from the underside, and the interior glass had to be remoulded with a bubble to accommodate the splayed underside of the dome. This bubble in the glass remained on all future standard releases without domes! An unusual version was made in small numbers without a dome (and without the hole in the roof to accommodate it) but still in white and with the two green panels, but without labels, and this is a highly sought after piece, though why such a curious coloured model would have been made at all is a mystery. Another special edition model which creates interest was produced for the fan club of an Austrian racing driver, possibly as many as fifty thousand, to celebrate the BMW racing driver Sepp Manhalter. This model was also white, with the standard BMW label to the bonnet, and a specially designed “S. Manhalter” signature label on the boot lid. Later issues of the orange model could be found with an ivory interior, and also with clear windows, both in relatively small numbers, but are not too hard to locate. Particularly tough to locate however are green window examples with small narrow dot dash wheels, or equally tough to find are those with large dot dash wheels from the #23 Atlas, which may perhaps have been fitted at the factory as a joke, as they sit extremely tightly inside the wheel wells and will not rotate at all! A well known and rare variant of this model is painted dull red and commands a serious premium, such models do not include a “BMW” label. An even rarer variant exists in a brighter red. The BMW was one of the casualties of the no less than 22 new releases of 1982, replaced by the Kenworth Cabover Aerodyne. However the mould was shipped to both Hungary and Bulgaria to be produced in a plethora of different interior and exterior colours! These look back in time articles are in no small part due to the painstaking efforts of Graham Tomlinson. Our final report of this type will appropriately focus on the last Lesney cars – the Ausi Quattro, Pontiac SE, Fiat Abarth and Matra Rancho. 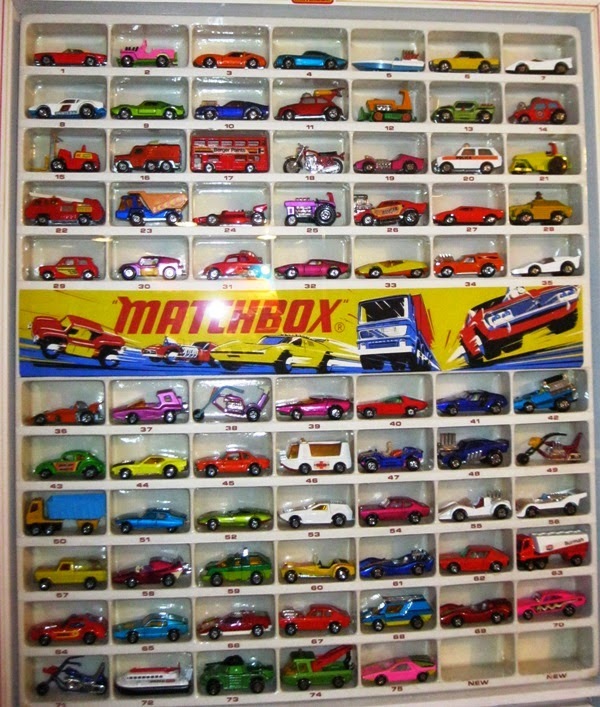 My last report will centre upon the Gathering and what Matchbox holds for the future.